NASA astronauts Scott Kelly and Tim Kopra help ESA (European Space Agency) astronaut Tim Peake with his Extravehicular Mobility Unit (EMU) fit check. Astronauts Tim Peake and Tim Kopra continue to prepare for their 6.5 hour spacewalk on Friday of this week. During the spacewalk they will be replacing a failed voltage regulator which will return power to one of the eight power channels. 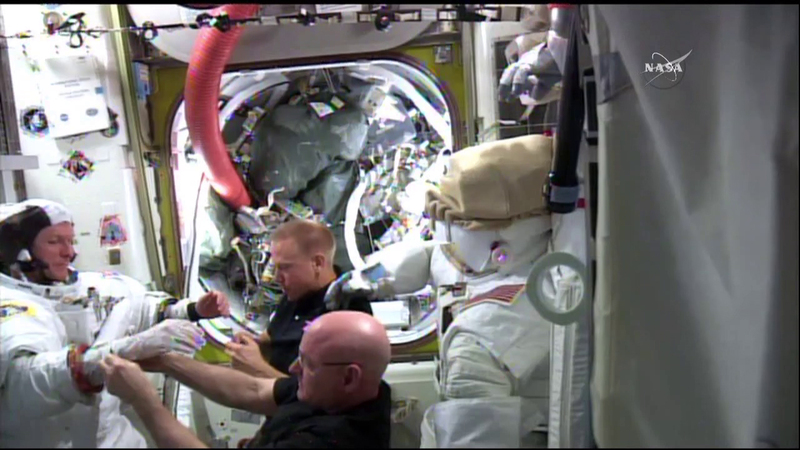 Meanwhile, Commander Scott Kelly is gathering hardware for the fluid shifts experiment. Tomorrow, he and his one-year mission crewmate Mikhail Kornienko will be putting on the Russian Chibis suit, a lower body suit which redistributes fluids back to their legs. During this part of the experiment, they will be taking ultrasounds of their eyes to explore the correlation between body fluid distribution and potential changes in vision. Russian cosmonaut Sergey Volkov has been taking readings for the Vibrolab experiment. Monitoring micro vibrations can help to understand how tiny movements affect science experiments on station. I follow all the space news. Thanks for publishing photos & stories. GREAT !!! !